In discussing the quality of austenitic stainless steel welding consumables, the ferrite content of the weld metals is an important matter. Ferrite is very effective in preventing hot cracking in austenitic stainless weld metals. However, ferrite can also cause embrittlement (a-phase embrittlement) of the weld metals at high temperatures and decreases impact notch toughness of the weld metals at cryogenic temperatures. The control of the ferrite content, therefore, is very important in the design of chemical compositions of welding consumables. General austenitic stainless steel welding consumables such as Type E308 and E308L are designed so that the weld metals contain approximately 3-10% ferrite in order to prevent hot cracking and minimize the high-temperature embrittlement. Fig. 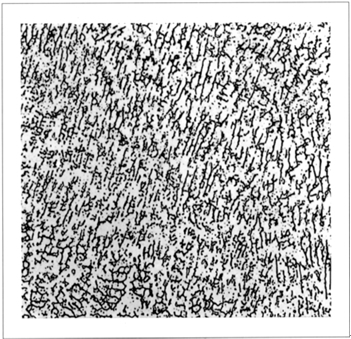 1 shows the typical microstructure of an E308 type deposited metal: the dark areas are ferrite and the white areas are austenite. Ferrite and austenite are very different in their respective physical properties. Fig. 2 compares differences between the two on typical physical properties. 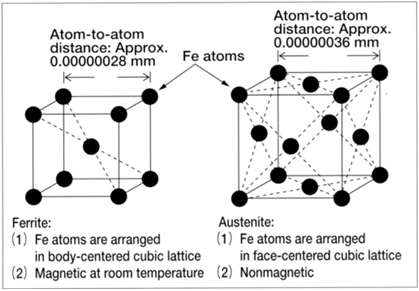 The difference in magnetic properties is a very important in the discussion of the ferrite content of an austenitic weld metal, because magnetic methods (besides chemical and metallurgical methods) are often used for measuring ferrite content. 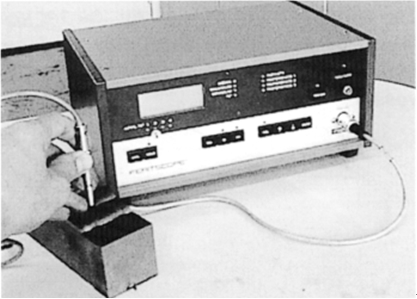 Of magnetic measuring methods, a Feritscope (Fig. 3) is most useful to measure directly the percentage of ferrite in welds at site.